London's Evening Standard released their annual list of 1000 most influential people, and it looks like Amal Clooney (née Alamuddin) is one of the top Londoners on the list and the top woman. Clooney, listed as a barrister, came in fourth, behind Chancellor of th Exchequer George Osborne, London Mayor Boris Johnson, and Deep Mind Technologies founder Demis Hassabis. That puts her ahead of the like of Prince Harry, Victoria Beckham, Malala Yousafzai, Kate Bush, and Benedict Cumberbatch. The Evening Standard insisted that Clooney's high placement on the list is due to her efforts to help Greece win back the prized antiquities from England and not because of her newlywed status with the Academy Award-winning thespian. Thanks for clearing that up, Evening Standard, though I am pretty sure her resume speaks for itself. But wow, what a year for her. 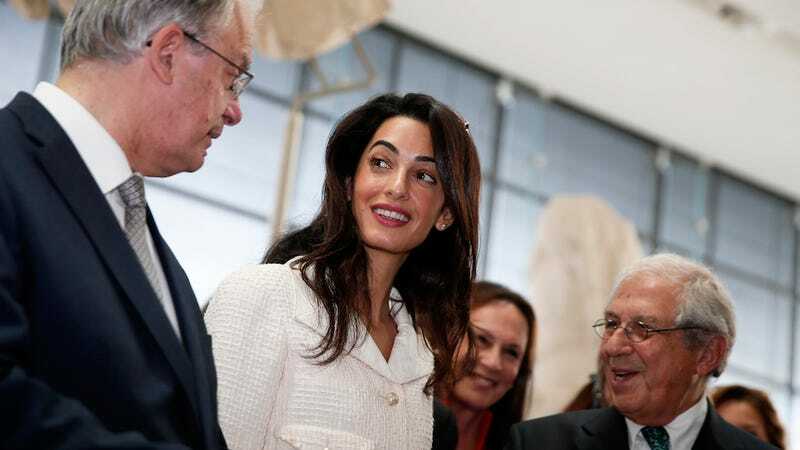 Everything's coming up Amal!